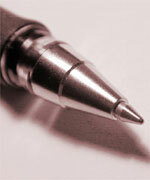 This is an extremely simple trick to fix a ball point pen that refuses to write. Someone taught this to me when I was little, I have used it ever since. If your pen has ink in it, but just refused to write, the ball is probably stuck. To fix, simply draw a few circles on a glass surface (the closest window works well). This frees up the ball and your will be away writing again!